Ken's gone from a tag-along and Camera-Equipment bearer to an eager photography participant! Yesterday evening, as Ron and I stood glued to our cameras-on-tripods, Ken meandered to a location around the building behind us to where he could see the sunset. 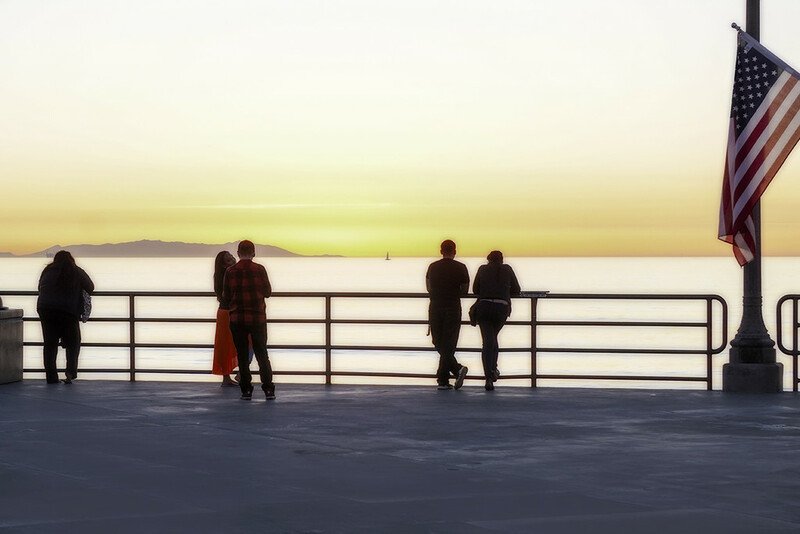 I love this image of people looking across to Catalina Island and a nice balance with the flag. I did the post processing for him; he hasn't ventured into that realm yet, but I thought he'd already been successful with a nice composition and his first street photography! Ken's obviously got the "eye!" Nice capture Ken!! Great shot, Ken. The red skirt in that spot is a masterstroke of good luck or your clever POV. @ethelperry I'll have to answer for Ken, Ethel...I'm always in charge of the comment section! I agree with you! The sun shining through it really emphasizes the direction of the low light. Thanks for stopping with a comment for him! Wow Ken this is fabulous! Makes me think of those paintings by the Italian (my might not be Italian) artist with the people dancing. I can’t think of his name? Love the composition and that red dress just pops! What a great eye you have! Beautiful! Fav! Jack Vettriano - he is in fact Scottish! Lol! A gorgeous composition, the flag is a great finishing touch. Yay Ken! This is a great photo! I too love that skirt, it’s wonderful. Lovely composition! Great eye, Ken! Love that sunny sky , and the people are spread out just right! You'll have so much fun doing it together. Wonderful image...I like the flag in this shot. Please let Ken know I think he did a fabulous job on this shot. The composition and dof give it a magical feel. FAV for KEN!!! Tell Ken he has learned well from the master, all those years of watching you as rubbed off!! Top shot Ken, good to see you've caught the bug. @blightygal What a fabulous comparison for Ken! I love that painting, but it didn't come to mind, thought it also did for Pam @pamknowler Both of you, thanks for the lovely compliments for Ken...I know he was really tickled that I put up one of his pictures, and that, more so, it was so warmly received! wonderful capture and beautiful editing, so favs for both of you! Beautiful , and dreamy, candid Ken. Fav. You may do some more. way to go, ken! but that we know ken's been taking photos occasionally especially when you're the subject, n'est-ce pas? the red skirt reminds me of the singinģ butler painting, for some reason. hah! and there i thought my comment was original. i should've read the comments first. but then i forgot to say aces!